Devin Hester has been a key part of the Bears for seven seasons. All Bears fans have fond memories of him starting the 2006 Super Bowl game with a touchdown kickoff return, and his many great plays after that. But Hester's not producing the way he once did. In fact, after he heard that Lovie Smith was fired, he talked about ending his football career. Now, Hester is saying that he wants to continue to play, but one thing is clear: He shouldn't finish his playing career in Chicago. Hester opened the door with comments he said over the weekend. 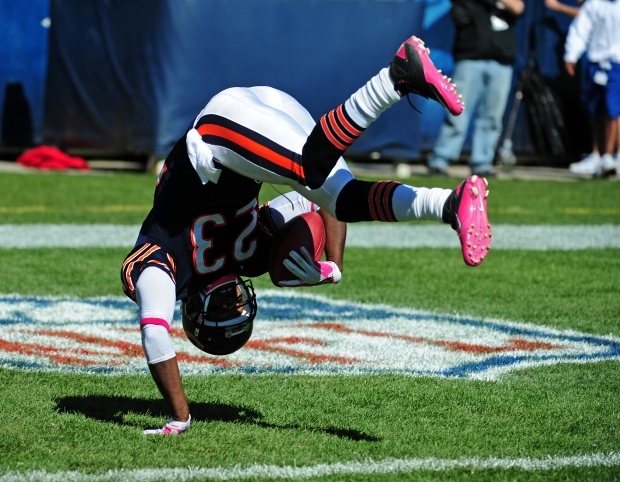 "I don't want to walk away from this game with another season going the way it ended this year," Hester said. "It might have to take a fresh start somewhere else." These aren't the angry words of a man demanding a trade. More, Hester is looking at the facts and seeing what's next in his career. For one, Hester's 2012 was disappointing. He was down in return and receiving yardage. He was targeted fewer times, but also had a much lower average yards per catch. Part of this was because of Brandon Marshall's presence, but it doesn't explain Hester's disappearance on special teams. Even with a new coach and offense in place, Hester still needs to look elsewhere. According to Hester's former receivers coach Daryl Drake, Hester never found chemistry with quarterback Jay Cutler. "Jay is a tough, tough-minded guy. He looks at things a lot differently. Devin is more of a compassionate-type of guy," Drake told the Chicago Tribune. "They’re total opposites. At times, that probably made things a little bit tougher. But could they co-exist? Sure, if they both work at it. But it takes both of them to do it." Cutler's tough side has caused some problems on the team. He bumped up with linemen J'Marcus Webb during the Bears' loss to the Packers on the sideline. He's also been spotted getting angry with teammates and coaches. Hester needs reassurance and compassion. It's not likely he will get it out of Cutler. Dave Toub, Smith and Drake, three coaches who did always have Hester's back, are gone. The best option is for Hester to head to one of the league's other 31 teams.